This Monte Vista addition transformed a modest, prairie style residence in San Antonio’s Monte Vista historic district into a more livable home for a growing family and provided the owners with a new master bedroom retreat. The design solution created a new master bedroom suite opening onto a wood deck overlooking the backyard. The tall volume of the addition provides a “dramatic reveal” and complements the existing horizontality of the residence while capturing natural light with clerestory windows and enabling the display of large wall-mounted art. A custom steel and wood alternating tread stair leads to a new attic storage loft. 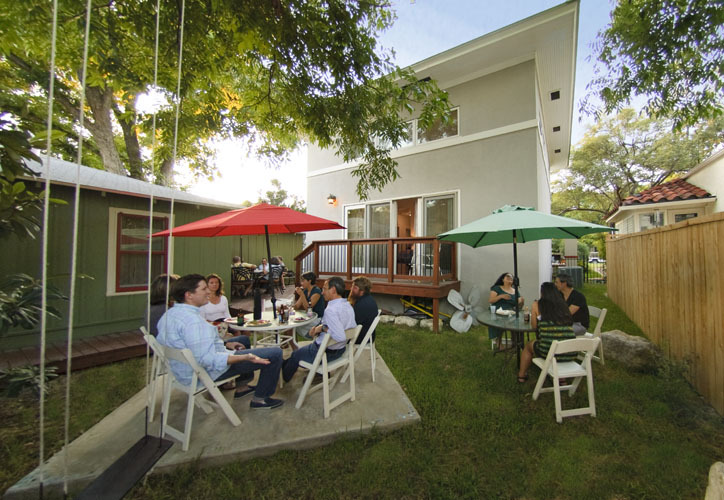 Services provided by SYNCRO Architecture Studio included all phases of design and documentation for review and approval by the Monte Vista Historical Association’s Architectural Review Committee, and presentation to the City of San Antonio’s Historic Design and Review Commission. Structural engineering and architectural construction administration were provided by SYNCRO and our team of consulting engineers. Relocation of electrical service and HVAC system components were required allowing upgrades for energy conservation and efficient utilization of outdoor spaces. stucco exterior, galvalume standing-seam metal roof, bead-board overhangs, fiberglass insulation, wood windows with low-e insulated glazing. Posted in homes, project type. RSS 2.0 feed.